We count amongst our clients some of the largest bus and coach companies in the country. Jobs come to us from all manner of sources; we hold a contract with National Express that covers local operators including Travel West Midlands, Travel London, Travel Coventry and Travel Dundee. No job is too big, too small or too complicated for Trailways! In fact, some of our customers refer to us as the “A-Team” as we are willing to take on and complete tasks that others in the industry turn away! 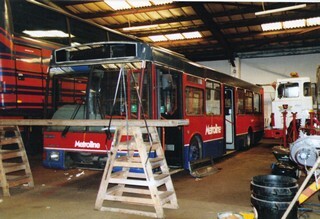 Most of our bus and coach body refurbishment work involves stripping out and replacing floors or panels as required, but we are often tasked with other jobs such as taking out and refitting seats, moving hand poles and other furniture in order to suit different configurations. We have a range of bus refurb skills covering the breadth of work required to service, maintain and construct a bus or coach. In turn, this means Trailways is a “one stop shop” and we never need to turn jobs away – no matter how complex the instruction. Enquire about our services today by calling 01922 495522.